If you look around at all of the new homes being built today you’ll find a few that are particularly unique among the many that are so much the same. The latest addition to the Rustic Ridge neighborhood in Franklin Park is one of those unusual homes though it’s still common enough to be considered an example of the vernacular; for the early nineteenth century that is. This home was designed and built by Don Horn of Jerry Horn Construction, a full service firm with operations in both residential construction done locally and commercial construction services provided throughout the country. The William Flinn Tavern is based on a circa 1840 house that sits directly on Route 8 (the Wm. Flynn Highway) in Alison Park. This is a very simple example of an Italianate style with its wide bracketed overhangs. 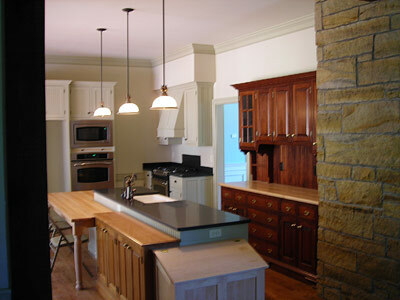 The kitchen wing is borrowed from the “Old Stone House” in Butler County that also sits right on Route 8. This 1820 house was used as a tavern and stagecoach stop. 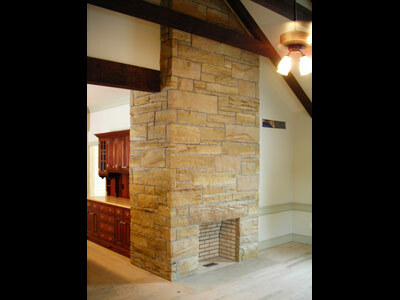 The stone used to reproduce the wing and the stone fireplace comes from the Raducz Stone quarry that is also located on Route 8 in Butler. For that reason, we named this home that represents the early 19th century Western Pennsylvania vernacular for the William Flynn Highway. On the exterior the sand molded red bricks closely mimic the early handmade brick that give the old houses their unique character. 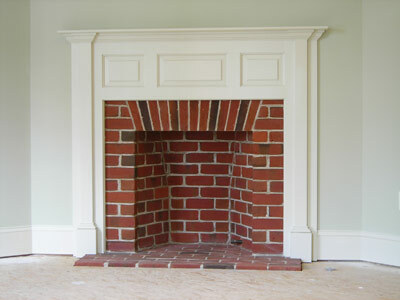 The brick bond pattern is also common to the period with every sixth course laid with the header end showing to the outside. 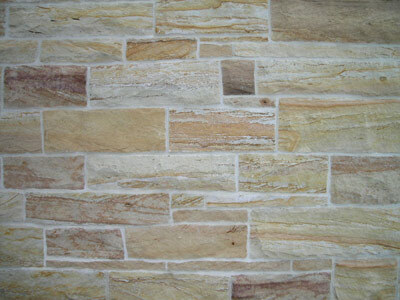 The locally quarried sandstone, spit against the grain, also reminds us about stone houses that were built with the stone found around the site. For a more authentic look, the three main sections of the building, the brick house, the stone wing and the garage, are detailed differently to give the “added-on” look common to the old houses. 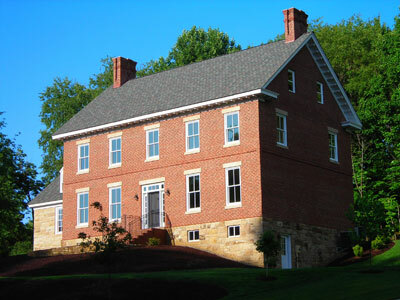 The 1840’s brick house sits on a rubble, or fieldstone, foundation and boasts a more elaborate bracketed cornice and 2- over-2 window sash with smooth-sawn sandstone lintels and sills. 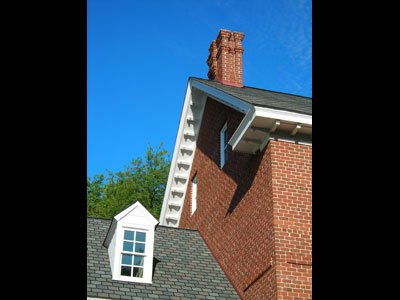 The balanced double chimney stacks are more to the Queen Anne style with deep recesses and projecting corbels. 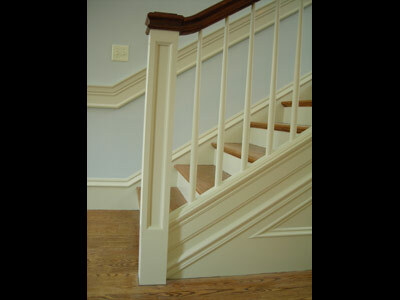 The earlier 1820’s wing is built of a coursed ashler sandstone laid with white mortar and the cornice is a classic Georgian detail seen throughout Colonial Williamsburg and is highlighted with a pedimented gable end. The windows on the wing include the earlier 6-over-6 sash muntins and the tall and narrow Virginia dormer; the original colonial skylight. 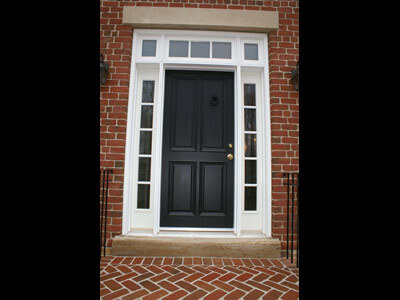 The carriage house is attached by a small connector and is finished with the simplest details, including the three carriage house doors. 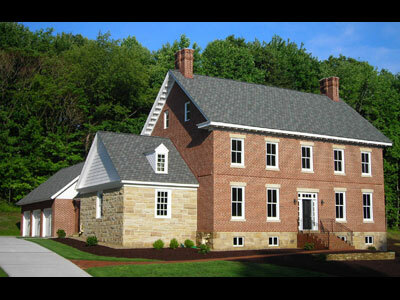 All is capped with a simulated slate roof using lifetime fiberglass shingles. Though the exterior trim is detailed and extensive, it’s built with low-maintenance aluminum and decay resistant composition materials. But the most unusual thing about this house is the kitchen. It defies description by any one particular style. 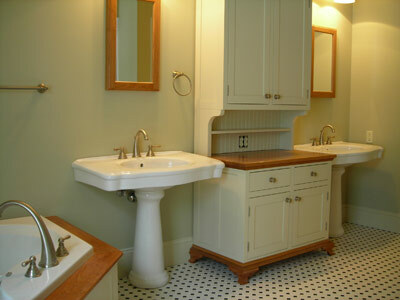 The center-piece is the island, composed of the painted sink cabinets with a granite top and cast-iron sink with an aged copper faucet; a maple butcher block topped country table; a cherry low-boy cupboard; and a salt-box styled trash/recycling bin. 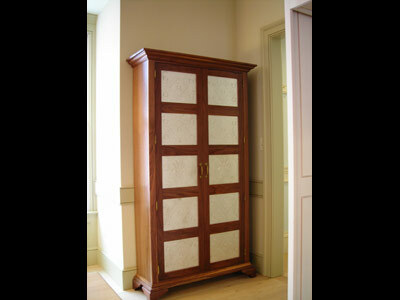 For storage, behind the island is a classic cherry china cabinet with polished brass hardware. The modern working appliances are housed in the more conventional painted cabinets in the corner. 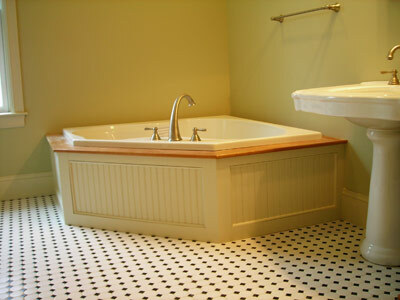 They are painted on- site to match the other trim in the kitchen and they show their period style with bead-board panels and oil rubbed bronze hardware. On either side of the walk-in bay window is the Pennsylvania black walnut pie safe with pierced tin panels and the mission styled stand-up desk made of quarter-sawn oak with walnut pins in the mortise and tenon joinery. The desk is designed to house the now-required modern computer. 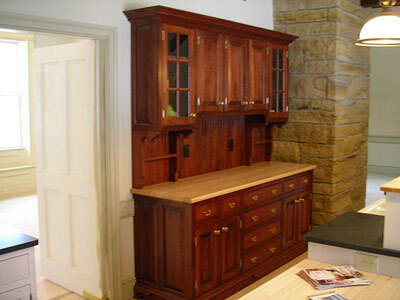 In keeping with the Western Pennsylvania style and character of the house, all of the cabinetry is built by the Amish family of Troyer Woodworking in Mercer. Next to the kitchen, the family room maintains the rustic styling seen on the exterior stone wing with a 17 foot high vaulted ceiling framed with solid oak timbers from Venango County accented by a sandstone fireplace, just one of the five masonry fireplaces in the house. 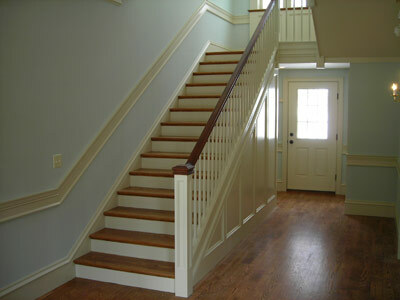 The dining room and center entry/stair hall, which extends from the front door to the back door, are done in the high federal style that matured in the early nineteen century. 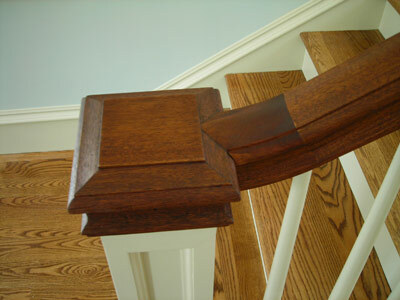 The library and tavern room show trim details in an authenticWilliamsburg style. The ten-foot high ceilings and the gentle rise of the main stair, with it’s mahogany handrail, are some of the details that may convince you that this was once an old house. The master suite has it’s own fireplace and nine-foot high ceiling, with 1920’s style ceramic tile and bead-board tub surround, pedestal sinks, and a hutch-type vanity in the bathroom. 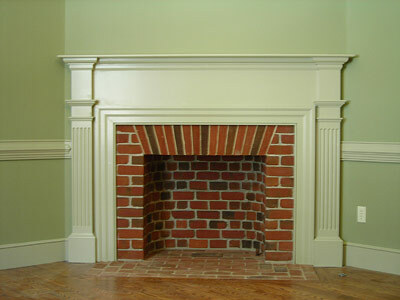 The five bedrooms include two on the third floor showing the large exposed-brick fireplace chimneys.